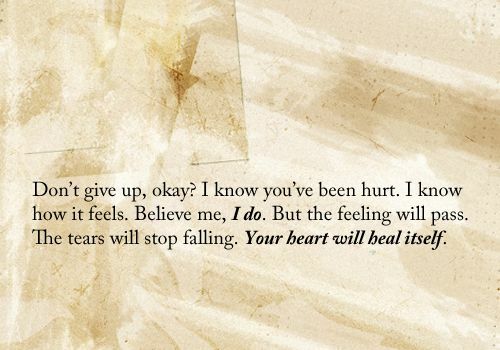 Don't give up, okay? I know you've been hurt. I know how it feels. Believe me, I do. But the feeling will pass. The tears will stop falling. Your heart will heal itself. Many of us have experienced a bad break up in our lives and know what it takes to get over it, while some of us may just now be experiencing one and feel as if life itself is over and that the pain you may be feeling will never end. Believe those of us with the experience of a bad break up, what you are experiencing right now will end. You must understand that this is just a season in your life right now, and even though the pain you feel may feel unbearable at times, your soul has to deal with letting go a person that you never thought it would have to let go of.